Edmonton, the capital city of the province of Alberta, has an metropolis population of about 875,000 and is a city for all seasons -- and all tastes. 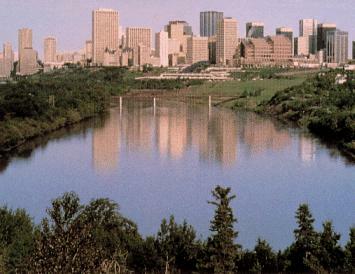 With its unique blend of big city style and small-town hospitality, Edmonton has the best of both worlds. Edmonton summers are very pleasant with up to 18 hours of sunlight per day and daytime temperatures averaging 18 �C (64 �F) with relatively low humidity. The long summer days are great for riverside walks, golf, cycling tours and exploring around town. A great place for visitors to explore is the North Saskatchewan River, which winds through the heart of the city. This beautiful valley, which is filled with wildlife, hiking trails and boreal forests, includes North America's longest stretch of urban parkland. More than 50 kilometres of trails are designated for biking, hiking, jogging and cross-country skiing. There are also more than 50 golf courses within a one-hour drive. The world famous Banff and Jasper National Parks, which offer excellent skiing in the winter and outstanding hiking and sightseeing in the summer, are only four hours away. Edmonton has more than 2000 restaurants and many shopping centres, including North America's largest indoor shopping and amusement venue, West Edmonton Mall. The recently opened Winspear Centre houses a professional symphony orchestra, opera and ballet companies. Host of the 2001 World Track and Field Championships and prior hosts to the World Universiade Games (1983) and the Commonwealth Games (1978), Edmonton has some of the most outstanding facilities for amateur and professional sports anywhere in North America.� Known as the "City of Champions", Edmonton is also plays host to several major league sports teams which include the Oilers in hockey, the Eskimos in football, and the Trappers in Triple A baseball. As Alberta's capital, Edmonton is home to Alberta's beautiful legislature building and legislature grounds – both of which are a short subway ride from downtown.� Edmonton also has three superb museums: the Provincial Museum, the Space and Sciences Centre (the Odyssium) and Fort Edmonton Park.� These highly interactive facilities attract hundreds of thousands of visitors a year.�� As a "green" city, Edmonton has an extensive transit system including a modern bus fleet and a clean, quiet subway (LRT) which connects the downtown core to all of Edmonton's major attractions, educational institutions and larger shopping malls.� Travel on the subway throughout the downtown area is free.